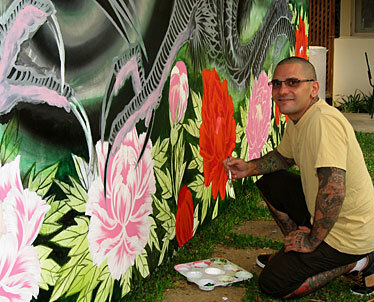 Tattoo artist Mike Ledger's installation at the Contemporary Museum, "Heavenly Garden," is situated on the exterior wall next to the café. The painting took about a month to complete. The gorgeous nature that surrounds the Contemporary Museum at Makiki Heights served as inspiration for mike ledger as he planned out his installation nearby the museum café. "I saw the trees, the background nature, and thought I'd bring that nature into the piece," he says. In fact, when viewed from a distance, the greenery perfectly frames the huge painting of a winged dragon in a lush forest of expansive trees and bright flowers. If Ledger's work, with its dragon image and bold flora, brings to mind the vivid, dramatic artistry of tattooing, that's because tattooing is Ledger's day job. And it's a very successful one, at that. Ledger began an apprenticeship in tattoo art in 1989, and for a year, he swept floors and cleaned needles - "all the grunt work" - as he learned all the basics. The career choice proved to be a fabulous fit, and by 1993, the talented artist was racking up awards and traveling the world, with eager patrons awaiting him at every stop. Today, Ledger's sitting pretty in his self-named McCully shop, where he has clients lined up two years in advance. So why would this king of tattoos be interested in spending time at the museum instead of designing works that can cost as much as "a downpayment on a house"? "It's an honor to do this," Ledger says of his donated piece. 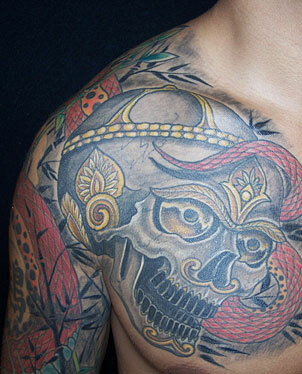 "I want to bridge the two worlds of tattoo art and museum art." 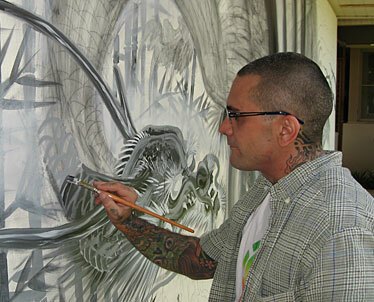 Ledger, an award-winning tattoo artist, has been invited around the world to do his intricate, vivid work. Ledger at the beginning stages of his museum painting. Ledger grew up with a father who painted, so he appreciates museum art as well as his own art form, he explains. The hope is that the installation will encourgage a broadening of appreciation in others, both museum patrons and tattoo fans. "If I can be influential either way, that's a good thing," he says. "I love Hawaii, and I want to give back." Ledger's work will be up indefinitely, until the museum moves into the construction phase of its expansion plans and the building bearing his work is torn down.